"Mens sana in corpore sano", or a healthy mind lives in a healthy body. Long awaited holidays can turn into a great pleasure if you find time to be active in sports. Biking, hiking, making joga or exploring the paths in a park nearby - choose your favorite activity and go ahead discovering a new outdoor side of Amsterdam, Prague, Paris, Barcelona or Istanbul! Check below some ideas and tips for your next trip. Amsterdam is famous for its bikes. Did you know that 60% of trips are made by bike in the inner city? So why not explore Amsterdam like a local on a bike! 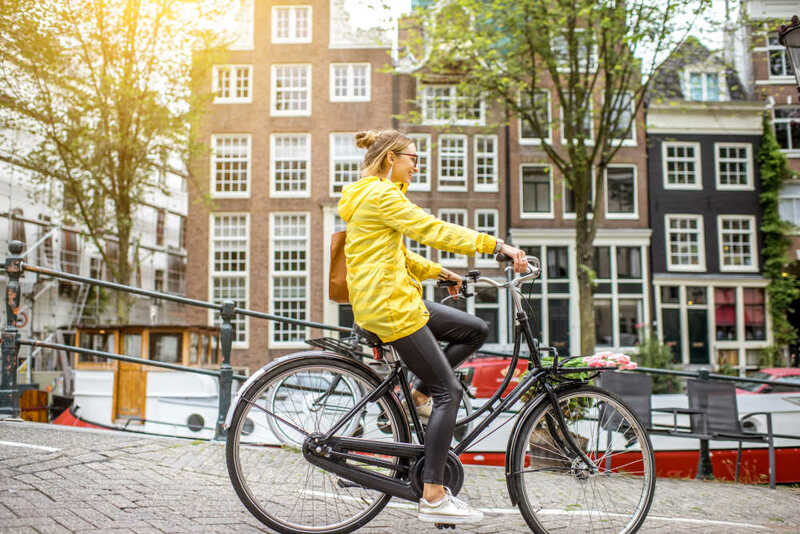 TIP 1: Take a bike tour that shows you the major historical highlights of Amsterdam like the Van Gogh Museum, the Red Light District or the Anne Frank House and brings you along the famous canals. TIP 2: Some tours show you the hidden gems and backstreet of the Dutch capital... Already wanna join them? Amsterdam is not only famous for its bikes but also well-known for its canals. In 2011 the UNESCO placed Amsterdam’s 17th century Canal Belt on its World Heritage list. Approximately 200 tour boats carry more than 3 million passengers a year. A classic under the canal cruises is of course the city canal cruise. Discover all of the historical city highlights but also the urban modern areas. TIP: If you would like to cruise on Amsterdam’s canals like the locals do, you certainly should choose one of the small open boats often referred to a Blue Sky Boats. Every Friday Night at 8:15 pm you can join a roller skating procession for free. The 20 km tour starts from outside the former Filmmuseum in the Vondelpark. The tour is changing every time and is a great way to discover areas of the city you otherwise would not see.You do not have to bring your skate along. Skate can be rented near the entrances of the Vondelpark. TIP: Since the Friday Skate Night is weather dependent, we recommend you to check the website whether the skate is going through or not. Get on your bike and take a tour out to the beautiful Karlstejn Castle, located about 32 km outside of Prague. This 6 hour bike ride is very easy and perfect for enjoying the sun! The guide of the tour will also stop along the way and show you some important sights. After you reach Karlstejn you will stop at a restaurant and receive a train ticket to be able to go back by train in the evening. Just an hour drive from Prague you can explore this astonishing national Park! Once you get there you will understand why the beauty of this park has inspired so many writers and painters. Included in the tour are the transfer from your hotel in Prague to the national park as well as two different hikes and a lunch in Kost castle! Montserrat Nationalpark: A little bit outside of the city away from the busy streets and the beaches is one of the most impressive mountains in Spain: Montserrat. Hike up this beautiful mountain with a guide and get ready to be amazed by the stunning view! There are a couple different Tours available, most of them start at around 8 am and finish in the afternoon at 3 pm. This tour takes you through traditional Wine yards that have been around for over 2.000 years. Run by the families, these wines have a very high quality and are known among locals of the area. On this tour you can not only taste the amazing wine but also some local delicacies. TIP: Accompanied by a family member of the wineyard the information is going to be first hand! Is there a better way to explore the city than by bike? This bike tour takes you through the city with a local guide and includes all the important sights as well as hidden gems! The tour is not very exhausting, there will be a stop every 100 meters to hear about an interesting sight and take pictures. TIP: The last stop of the tour will be at the beach bar so you can enjoy the sun and some cocktails. At times, the loud and busy city life in Paris can be a little overwhelming and then we all need a relaxing time-out. A wonderful place for those occasions is Paris’ botanical garden - the Jardin des Plantes. Take your time and stroll through the marvellous garden, which is the home of over 10,000 species, as well as rose-, winter- and Alpine gardens, tropical greenhouses and a zoo. TIP: Don’t go here in the winter, nothing to see....spring flowers are blooming for the rest of the year. What do you need urgently during hot summer days in Paris? Right, a cool swimming pool. The Joséphine Baker swimming pool, which is anchored at the Seine river and therefore floating, certainly is the place to be. The swimming pool is open throughout the entire year, however with varying opening times. Naturally, in the summertime, with its open glass roof, the swimming pool offers a unique outdoor experience in accordance with the Parisian chic. TIP: Entry: €3.60. Entry during summer period: €6.20. A perfect experience for jogging enthusiasts is Paris Running Tours, in which you are discovering the exceptional sights of Paris in the course of a run through the city. You will get picked up at your hotel or another previous arranged spot and a Parisian local will inform you about Paris’ sights while jogging. Yet there is no need to worry, the guide will adjust to your pace and there will be enough breaks during the jogging tour. TIP: There is certainly no more extraordinary way to get to know the city and some hidden places in Paris. The handsome Blue mosque of Istanbul, also known as the Sultan Ahmet Camii, is one of the finest constructions in Turkey and in the world. The religious place is an iconic landmark of old Istanbul. The style, design and materials reflect the Ottoman architecture at its greatest. TIP: Open to everyone, it is one of the top visited attractions in Istanbul and Turkey. If you go to Istanbul, you need to make a detour to Cappadocia to enjoy an exciting hot air balloon tour and discover the stunning landscape of the Cappadocia region. There is something magical about floating in a hot air balloon and looking at the world through the eyes of a bird. TIP: Watch the sunrise over the valleys and admire Cappadocia's beautiful scenery of tall, volcanic rock spires and high plateaus. Exchange the bright lights and busy streets of Istanbul for the dusty roads and forest trails that the country has to offer. Jeep safari is a great adventure to explore the other face of Turkey. You will discover green and exciting landscapes, hidden natural beauty, canyons, and you will appreciate the traditionally dressed villagers on donkeys. TIP: This tour offers a sight of real Turkish life, as you wind through rural farmlands, stop at mountain villages and venture off-road to little-known viewpoints.